Sunday Seniors on the Move and Happy Father’s Day! Happy Father’s day to all the dads in the world. My husband and I spent the afternoon with our two daughters and two granddaughters. I miss my father terribly. 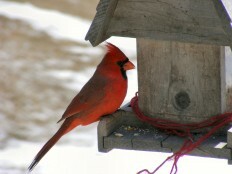 I think of him every time I see a cardinal eating out of the bird feeder on the front porch. So what’s been happening on the Senior Scene this past week? Here are a few articles that may be of interest. The main reason to stay active is to reduce health risks. In the following article from SeniorJournal.com, the American Heart Association lists 7 things all “citizens” can do to reduce the risk of strokes. 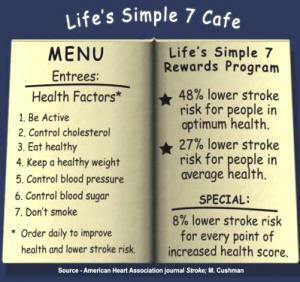 Source: American Heart Association Journal Stroke: M. Cushman. Next, a group from Hurst, TX really knows how to organize a senior social calendar and newsletter. What a great resource for anyone who wants to get ideas for activities to provide for the seniors in your area. It’s always a good idea to tell your doctor about any exercise you begin, especially if you have pre-existing health problems. This article from SparkPeople.com discusses the importance of building cardio health. Begin slowly and work your way up to a more rigorous routine once you know what your heart can handle. Thanks for reading, and please leave a comment. Thanks Nancy, I almost didn’t get that one done, and when I read through it just now, I caught a couple errors I had to fix. My husband and I kept the grandkids last night… whew! God knew what he was doing when he made us parents at a young age.